Commissioner Dan Bernheim gave us an update on very recent negotiations between the Lower Merion School District and St. Charles Seminary concerning the potential purchase of seminary property for a 3rd middle school. Our understanding is that LMSD considers the timing of a potential sale (5 years) to be too far in the future and therefore unsuitable to meet a pressing need to troubleshoot overcrowding. We had a group discussion about the importance of limiting further school expansion on overcrowded Penn Valley neighborhood campuses for many reasons including limits to benefits for the children and neighborhood traffic. Thank you to Commissioner Mike McKeon for his attendance and thoughtful participation. Penn Valley hosts more public school children (approximately 1,700) than any other neighborhood in Lower Merion. There is a perception from outside our community that the Welsh Valley Middle School campus has room for further construction, but the school is at capacity and is almost out of impervious allotment for further expansion. The District has only recently expanded WV and will further expand the cafeteria this summer. It is also proposing 4 new classrooms to make room for the existing feeder pattern. Follow-up discussions with Penn Valley residents confirmed the existing neighborhood burden including significant traffic congestion at multiple intersections along Hagys Ford Road during pick-up and drop-off and ongoing erosion in the same area. These discussions prompted PVCA to draft a position statement to the LMSD making clear that we do not support any re-purposing of the former St. Justin’s church property (now part of the Welsh Valley campus) for anything other than field space. We do not support repurposing that portion of land for any use that will exacerbate congestion in our neighborhood, increase further crowding for children on the WV campus or will be at odds with the highly residential character of our area. Many of us do support the building of a 3rd middle school on an appropriate site. Penn Valley Mural Project Kick-off! Local Mainline Cycles owner, Dan Goldberg also joined us for the presentation. Dan has offered to host our mural on the side of his building and offered to help with the cost of lighting the mural if possible. The mural will be painted in September and October of this year including a community paint day! Community members brainstormed about ways the mural could be educational for children and adults alike including the possibility of a key for identifying plants in the mural. Lower Merion Township is graciously matching half the funds for the mural. 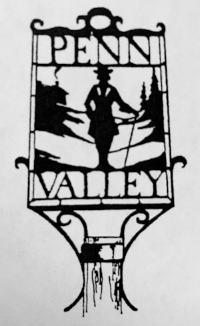 Penn Valley Civic will raise the remaining funds. $250 contributions and up will retain a spot for your name or business in the recognition box on the mural. Email pennvalleycivic@gmail.com with your interest. Thank you! We’re excited about the wonderful location for this public artwork and the jumpstart improvement to the Penn Valley business district, an ongoing priority for the PVCA. Officers were elected unanimously. Michelle Detwiler will return as president and Jen Kelly will return as treasurer. Steve Filippone was elected as our new vice president. Welcome Steve! In a follow-up discussion, Lisa Prosnitz was asked to be PVCA’s schools representative to follow LMSD-related issues including overcrowding and the potential for later school start times. Thanks to all for their willingness to serve. We appreciate your time and caring on behalf of our community.